A marble nine-foot monument of President Ronald Reagan is set to be unveiled May 10 in Bulgaria’s capital city of Sofia. The monument, which transpired with key input and advice from Young America’s Foundation and the Reagan Ranch, was erected in order to honor President Reagan’s critical contribution to the country’s liberation from communism. 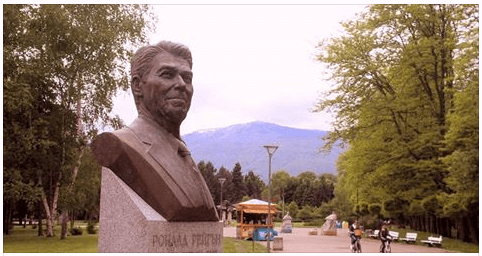 The ceremony honoring Ronald Reagan will take place at the entrance to Sofia’s famed South Park, one of the largest green spaces in the city. The idea was first forwarded by Konstantin Aradbadzhiez, former mayor of Sofia, and approved by municipal officials in February of 2014. The Bulgarian people revere President Reagan for spearheading international efforts to topple the Soviet bloc, ushering in their transition to democratic rule.